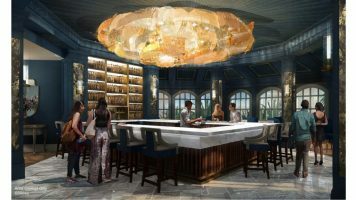 Tie your napkin around your neck, because Disney is excited to announce that a new “Beauty and the Beast”-inspired lounge is coming to Disney’s Grand Floridian Resort & Spa this fall. The enchanting lounge will celebrate the magic and romance of the popular Disney live-action movie. It’s the latest new Disney magic coming to Disney’s Grand Floridian Resort & Spa. In February, Disney announced a new Bibbidi Bobbidi Boutique location will open this summer at the beloved and picturesque resort hotel located on the banks of the Seven Seas Lagoon. With charm and elegance to be found around every turn, this quaint bar and lounge will be the place where you can put Disney’s service to the test and share a tale as old as time.